Jim Purbrick of Linden Lab, the guy who made Second Life run on Mono, shot after the Mono Summit 2007. Yes, I’m a year behind with my photo processing. Last weekend I had the pleasure of photographing my friends Christoph and Manuel Mitasch, aka Jonglissimo, a world-class club passing duo, holders of four club-passing world records and two-time IJA stage competition gold medal winners. 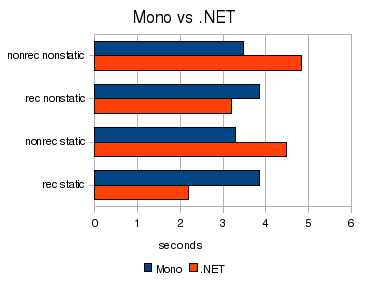 Until about a week ago Mono’s Monitor implementation, which is used for synchronized methods and the lock statement, was comparatively slow. Each Monitor.Enter and Monitor.Exit called into unmanaged code, which is very inefficient compared to a normal method call. We improved this situation by implementing fast-paths that can be called cheaply and that can handle most cases. The fast-paths come in two varieties: Portable fast-paths, implemented in CIL code, and native fast-paths, in hand-optimized assembler code. 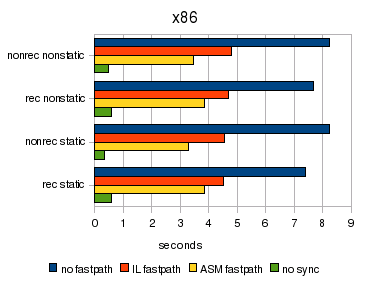 We only have assembler fast-paths for x86 and AMD64, as those are the most-used architectures that Mono runs on. 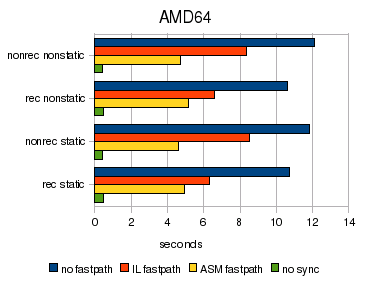 I did some micro-benchmarking to compare the fast-paths with the old unoptimized implementation. Each of the tests does 100 million calls to synchronized methods. Two of the tests call static methods, the other two non-static ones, and two of the tests call empty non-recursive methods whereas the other two call recursive ones. The blue bars represent our old implementation. The orange bars stand for the IL fast-paths and the yellow bars for the assembler fast-paths. The green bars represent the run-times for non-synchronized methods.